Trilogy at Tehaleh in Bonney Lake, Washington is Pierce County's first ever 55+ active adult community. The master-planned community of Tehaleh plans to support a community where residents will live in beautiful homes closely tied to nature for generations to come. Homeowners will find everything they desire and more with top-notch amenities, well-planned home designs, and surrounding scenic views. Trilogy at Tehaleh enjoys a breathtaking natural surrounding complemented by beautiful homes near the Seattle-Tacoma area in Washington. 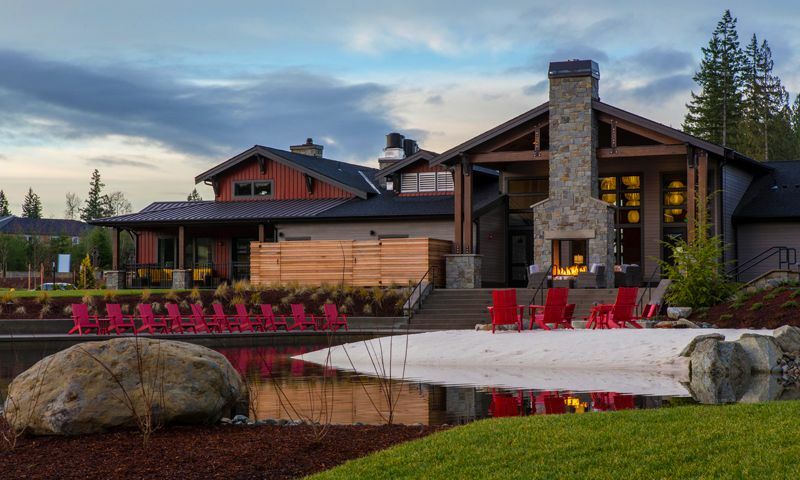 Trilogy at Tehaleh features a clubhouse called Seven Summits Lodge that provide fun and enriching activities for residents. True to Shea Homes, homeowners have a resort-style clubhouse featuring world-class fitness facilities and an assorted range of recreation and education opportunities. All amenities were built with the active lifestyle in mind with an emphasis on wellness, exploration, learning and new friendships. Homeowners have a fitness center and an indoor lap pool for staying in shape, while a restaurant and culinary studio for private parties, special events, or culinary demonstrations and classes. Neighbors gather in the meeting rooms for clubs and events and an artisan studio and hobby rooms keep everyone creatively engaged. The Hawk's Nest features billiards, shuffleboard, and a virtual golf course that allows homeowners to play on courses from all around the world without leaving their community. Outdoors, Trilogy at Tehaleh has a patio for enjoying the warmer months. Residents can also attend social events at The Post, the amenity center for all neighborhoods found within Tehaleh. Here, residents can grab a cup of coffee at Caffe D'Arte, meet new neighbors in the gathering room, or enjoy a beautiful sunset on the outdoor patio. The Post also acts as the information center and trailhead for the community's ten miles of walking and hiking trails. Trilogy at Tehaleh is located within the 4,200-acre master-planned community of Tehaleh. Shea Homes is nationally admired for its Trilogy communities designed specifically for active adults with single-story layouts, natural lighting and eco-friendly designs. The Coastal Collection features eight floor plans that range in size from approximately 1,400 to over 2,200 square feet and feature two bedrooms, two or two-and-a-half bathrooms and an attached two-car garage. This collection is as unique as the residents with an assortment of diverse architectural styles from which to choose. The Cortile Collection features four floor plans that range in size from approximately 1,400 to nearly 1,800 square feet. These beautifully crafted homes mostly feature one to two bedrooms, two or two-and-a-half bathrooms, and an attached two-car garage. Each home features open floor plans with a spacious first-floor master suite. The Shea 3D Collection offers some of the more modern floor plans available from Shea Homes. These homes range in size from approximately 1,800 to over 2,100 square feet and have two to three bedrooms, two or two-and-a-half bathrooms, and an attached two-car garage. The Estate Collection is Shea Homes' largest home collection in Trilogy at Tehaleh. These models offer active adults approximately 2,100 to over 2,400 square feet of living space and feature two or three bedrooms, two-and-a-half bathrooms, and an attached two to three-car garage. The Resort Collection is the newest Collection at Trilogy and features three thoughtfully designed floor plans that range from 1,342 to 1,678 square feet. The floor plans feature two or three bedrooms, two or two-and-a-half bathrooms and a two-car garage. The single family attached homes include open-concept living spaces and covered patio, gourmet kitchens, and elegant master suites. Trilogy at Tehaleh offers retirees a chance to live in a 55+ neighborhood within Washington's most distinctive, original master-planned community, Tehaleh. It is designed to cater to residents seeking an active adult lifestyle. Here, residents will find so much that inspires wellness and makes them feel truly alive with the state-of-the-art-fitness facilities to heaps of ways to stay fit concealed as fun. With Trilogy at Tehaleh situated in the highland forest, residents reap the benefits of Mount Rainier s views and the endless opportunities for outdoor recreation. Trilogy will bring its signature resort lifestyle to Tehaleh, providing an electrifying environment and a booming hub of activities.Currently residents can meet new neighbors and make new friends with community barbecues, brewery night, holiday parties and harvest day. Stay fit while exploring the great outdoors with the walking club or trail runs. Trilogy at Tehaleh is located in south Bonney Lake, Washington and is about twenty miles southeast of Tacoma with convenient access to Seattle, the eastside, and the natural beauty of the region. It is south of Lake Tapps and east of Puyallup. Its close proximity to Mount Rainier and Snoqualmie National Forest makes for easy access to some of the most remarkable mountain recreation areas in the Pacific Northwest. The planned commercial areas will feature various community shops and services within the Tehaleh development. Grocery stores, banks, pharmacies, and other daily needs are presently available about 15 minutes away. There is also a variety of restaurants to choose from. Additional shopping and dining options can be found an hour away in the Seattle-Tacoma metropolitan area as well as the region's international airport. Active adults who thrive in nature will get a thrill out of Trilogy at Tehaleh in Bonney Lake, Washington. Residents of Trilogy at Tehaleh enjoy exclusive access to the following amenities. The Post - 3,300 Sq. Ft. There are plenty of activities available in Trilogy® at Tehaleh®. Here is a sample of some of the clubs, activities and classes offered here. The Resort Collection is the newest Collection at Trilogy and features three thoughtfully designed floor plans that range from 1,342 to 1,678 square feet and feature two or three bedrooms, two or two-and-a-half bathrooms and a two-car garage. The single family attached homes include open-concept living spaces and covered patio, gourmet kitchens, and elegant master suites. The Coastal Collection features eight floor plans that range in size from 1,454 to 2,261 square feet and feature two bedrooms, two or two-and-a-half bathrooms and an attached two-car garage. This collection can be as unique as each resident as it offers an assortment of diverse architectural styles from which to choose. The Cortile Collection features four floor plans that range in size from 1,426 to 1,797 square feet. These beautifully crafted homes feature one to two bedrooms, two or two-and-a-half bathrooms, and a two-car garage. Each home features open floor plans with a spacious first-floor master suite. The Shea 3D Collection offers some of the more modern floor plans available from Shea Homes. These homes range in size from approximately 1,800 to over 2,100 square feet and have two to three bedrooms, two or two-and-a-half bathrooms, and an attached two-car garage. The Estate Collection is Shea Homes' largest home collection in Trilogy at Tehaleh. These models offer active adults approximately 2,100 to over 2,400 square feet of living space and feature two or three bedrooms, two-and-a-half bathrooms, and an attached two to three-car garage. We had been looking at homes in the Jubilee community in Lacey, Washington, which is also owned and operated by Shea Homes. But one day we decided to take a look at Trilogy at Tehaleh and were very happy with this newer community. We bought a designer home in the floor plan that we loved, and were moved into the home about 45 days later. Shea Homes builds a beautiful home, and we liked the idea of living in an active adult community, with miles of walking trails. The club house is under construction, to be completed by the end of 2015. In the meantime, the residents of Trilogy have formed a walking club that meets on Saturday mornings; a new Bunco group has been formed; a ladies' lunch is planned monthly, as well as other events. Our neighbors are so friendly and helpful, and they all seem to be very happy with their new homes and the community. Eventually, a retail center is planned, but today, we can get to services in Bonney Lake in about 10-15 minutes, or to Puyallup in about 20-25 minutes. We have a full selection of medical facilities, a good vet for our beloved Bella, and the whole new world of Washington State to explore. We especially liked working with the sales staff of Trilogy, and the construction team, who are very friendly and eager to please. We hired our own home inspector, and Trilogy completed every item on his punch list before we moved in. We especially liked the walk-thru inspection where we learned all about our new home and how everything works. It was a great experience, made easy by the Shea Team that supported us. If we had it to do over again, we would go with Shea Homes, and would instead use Shea Mortgage rather than our credit union that failed to be ready by the closing date (as our realtor said was so common for credit unions). We live 2 hrs north of Seattle, in rural & spectacular Puget Sound. We love living in the Pacific Northwest, but want a house with easier upkeep & we want to be closer to a community. We made an appt to visit Tehaleh because we wanted to sit down & discuss our many questions. We were told that with the exception of the Cortile collection (models with rear-entry garages), you could build any model on any lot. There were restrictions as to how close identical models could be to each other, etc., but otherwise, no restrictions. This is not true we found out - not all models can be built on any lot. We were told the lot premiums varied, anywhere from $5000 to $20,000. On a list we later received, the lowest lot premium was $27,000. That's a hefty premium. The salesman we had the appt. with was friendly & helpful. Until he realized we would not be buying immediately. Then he clearly was no longer interested in talking to us & told us to call & come back if we wanted to see more models. Before we left, another salesman showed us an empty model we had asked to see, but we had been told it could not be shown. The area around Tehaleh is OK. Not the greatest, not the most beautiful, fairly industrial. The models were very nice & seemed of very high quality. Overall, I thought Tehaleh to be expensive for what is offered & too isolated in a not-so-great area. Retail stores into Tehaleh itself are still a very long way off. they plan to break ground for the Trilogy Community Center in August 2014. In comparison to other Washington state Trilogies, however, I would definitely choose Tehaleh. Redmond is ridiculously expensive & the community felt like a beehive. Much closer to the central core & Seattle, but not nearly as nice a community. And Jubilee in Lacy is another beehive community that I would not consider. It will take some looking before we find out spot & it likely will not be Tehaleh. Tehaleh and Bonney Lake is one of the most gorgeous places in Washington state. It's about an hour from Seattle and Mt. Rainier is close by and makes for a stunning backdrop. If you love nature you will love living here. My husband and I have been out to visit this community a few times and are very impressed. Last we checked the clubhouse is in the works and we are very excited to see how that turns out. The homes are very beautiful and you can tell the builder Shea Homes puts a lot of thought in to every detail. We are so excited to build a home here when Roger retirees in a year! 55places.com is not affiliated with the developer(s) or homeowners association of Trilogy® at Tehaleh®. The information you submit is distributed to a 55places.com Partner Agent, who is a licensed real estate agent. The information regarding Trilogy® at Tehaleh® has not been verified or approved by the developer or homeowners association. Please verify all information prior to purchasing. 55places.com is not responsible for any errors regarding the information displayed on this website.